MIAMI, FL –July 31, 2012 – Lydecker Diaz Senior Partner Richard Lydecker was recognized by the City of Miami Beach for his dedication to the community during the commission meeting on July 18, 2012. 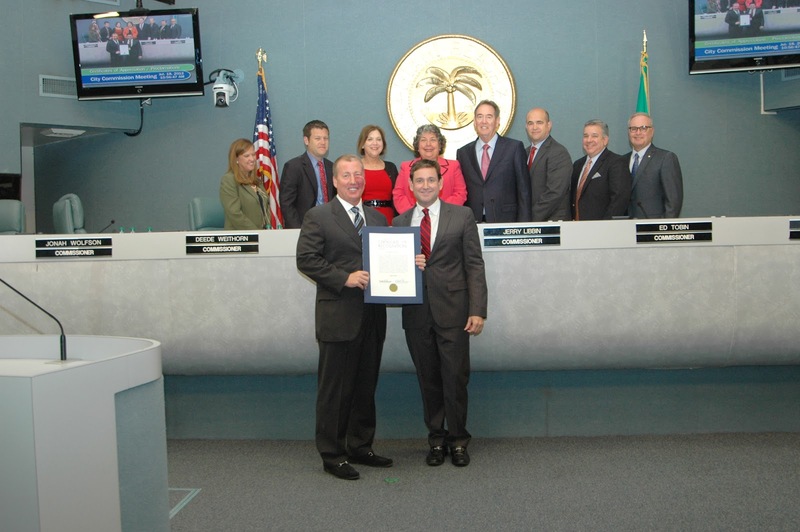 City of Miami Beach Mayor Mattie Bower and Commissioner Michael Gongora, along with the entire City Commission, presented Lydecker with a certificate in honor of his many community contributions. Among his advocacy roles, Lydecker is chairman of the Miami Dade Democratic Party, leading the party’s local efforts to ensure talented democratic candidates are elected to public office. He is also a board member of the Miami Downtown Development Authority, working to improve the quality of life for businesses, employees, residents, and visitors in Downtown Miami. In addition, he was cross appointed by US Senators Bill Nelson and Marco Rubio to be a member of the Federal Judicial Nominating Committee which nominates candidates to the President of the United States for appointments to the Federal Bench and the US Attorney for the Southern District of Florida. Lydecker also serves as board member of Camp Boggy Creek, a year-round medical camp for children ages 7-16 who suffer from chronic or life-threatening illnesses. Co-founded by actor/philanthropist Paul Newman and General H. Norman Schwarzkopf (U.S. Army Ret. ), the camp offers week-long summer sessions and family retreat weekends at no charge to the children or families.